Tell us about TeleCarib Labs? 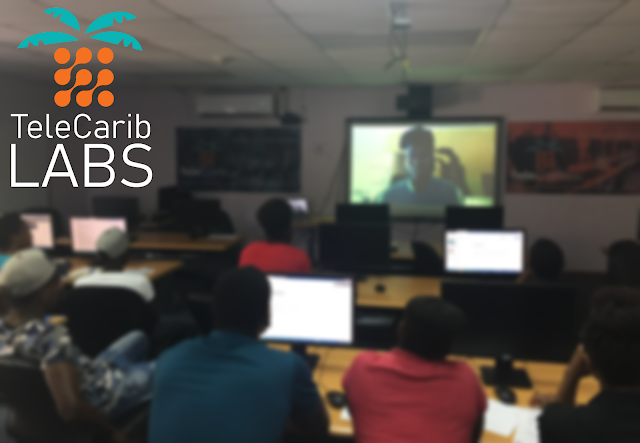 TeleCarib Labs, Inc. is an ecosystem development company focused on making St. Lucia the startup capital of the Caribbean. We provide collaborative workspaces and private offices, cutting-edge skill development programs, and access to a thriving global community of professionals. One of the programs we’re really excited about is Startup St. Lucia — the island’s national startup accelerator program which we’re launching with support from the Government of Saint Lucia. We’re welcoming innovators not just from St. Lucia, but from around the world, to help them scale from the Caribbean and beyond. We will begin accepting application in early 2019. My team would also be upset if I didn’t mention our indoor precision farm — which will be operational towards the end of this year. There’s an education program scaffolded to the farm so we’ll have an opportunity to raise awareness around food security, import substitution, and climate resilience. Describe the tech space in St. Lucia? Like many sectors in St. Lucia, the tech landscape is largely fragmented and innovation consequently tends to take place in silos. The tendency towards siloed entrepreneurship is a major inhibitor of growth in my opinion and is part of the reason we’re thrilled to be introducing the concept of coworking here. Describe what a "21st Century Saint Lucia" would look like? This is something we spend a lot of time thinking about at TeleCarib Labs. We see 21 st century Saint Lucia less as a pre-defined destination and more as a particular mindset to problem-solving. Relevant education, experimentation, and entrepreneurship are the pillars of this. A 21 Century Saint Lucia would be a beacon for this type of problem solving in the region. How can TeleCarib Labs help with these key issues; Poverty, diversification, environment and leadership? In 2018 there is still no public university on the island and the previous government spent nearly as much on active labor market policies, in terms of GDP, than some industrialized economies, all without putting a dent in unemployment (see here). Youth unemployment has been pernicious and hovering around 40% since 2013. Hotels and cruise ships cannot possibly absorb all these individuals. It’s time to stop tackling the familiar problems with outdated solutions. With this, TeleCarib Labs will help. The online education landscape is evolving at a blistering pace with an explosion of flexible, super high-quality, low-cost education platforms available today, but most St. Lucians just aren’t aware of what’s out there. By coupling online education with in-person support and mentorship within a community environment like the coworking space, TeleCarib Labs will allow participants to access in-demand skillsets that the traditional educational system has been unable to deliver. This particular program is called the Hybrid Learners program. Are there many startup accelerators or incubators in the Caribbean? Most of the incubator/accelerator models we’ve seen in the Caribbean have been either philanthropic in nature or propped up by external funding from IGOs — neither of which are sustainable. TeleCarib Labs is a private-sector led initiative and is therefore focused on the commercialization of incubated technology and helping startups scale to new markets. We do this by engaging both government and corporates in partnerships that support their growth while spurring a culture of innovation on-island. What are the main challenges entrepreneurs face? Entrepreneurship is a journey rife with challenge regardless of where we are but St. Lucia’s hurdles have traditionally stemmed from our small population, geographic isolation, and low risk-capacity. Small population size and our location on a map made it difficult for traditional entrepreneurs to access new markets. Borderless technologies and the rise of the digital economy have made those issues moot. Risk-capacity is increased when it’s distributed among more people and creating a thriving community will assist in this. Is the word "innovation" overplayed? Innovation is certainly a fashionable word but it’s not going away anytime soon. In fact, one of the first questions we ask participants during Startup St Lucia is “What exactly is innovation?” because it’s meaning has been somewhat watered down by the media. Is ecommerce/online payments difficult to setup in St. Lucia for entrepreneurs? Saint Lucia has a relatively high mobile and internet penetration rate but is still a largely cash-based society with relatively low credit/debit card penetration. Culturally, this is changing as more St Lucians purchase goods from places like Amazon, but there needs to be more local leadership from the financial community and startups alike. There’s a lot of low-hanging fruit in this particular space. How do you compare what you are doing to Silicon Valley? Silicon Valley is the mecca for entrepreneurship but is no longer the world’s only innovation ecosystem. The role of TeleCarib Labs is to go into the market and build linkages between the Caribbean’s early-stage startup ecosystem and more mature spaces like Miami, Chile, Boston, London, and Silicon Valley so that our entrepreneurs can access an established network instead of hacking at it totally on their own. What is a tech hub? A tech hub is a physical community platform with education, technology, and experimentation at its center. They are typically oriented towards industries relevant to the host community. If a tech hub is truly providing value to its community, it may eventually grow into an innovation district if it’s provided the proper support and coordination at a policy-making level. What are 5 things needed by TeleCarib Labs to do better work? It is still very early days for us so if you check in with me one year from now, I’m sure I’ll have a long list for you! *Blog Editor note : I put a reminder in my calendar to check back in 1 years time. Will link to the update from here. How can persons get involved? Thanks for asking Hassan. If people are interested in learning more about our services, please email info@telecarib.com for general inquiries and christian.w@telecarib.com for partnership inquiries. If you’re in Saint Lucia, we’re located in Gros Islet. Just drop by! Anything else you would like add? While TeleCarib Labs will be launching in Saint Lucia, we are doing so with a pan-Caribbean vision. If you are an ecosystem builder or member of the diaspora with experience in higher-ed, tech, or venture, I’d especially like to hear from you.